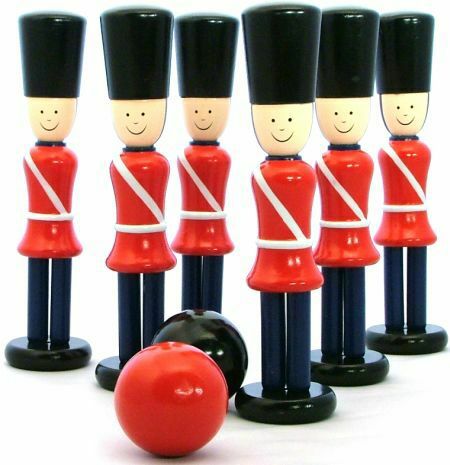 Bowling Soldiers Skittle Game is a beautiful, traditional toy comprising six large wooden soldiers, in classic guards uniform, and two wood balls one black and one red. This well made toy will provide lots of fun as you set up the soldiers and bowl them down. Designed to withstand rough play this is a great toy which you are allowed to knock over and scatter.. Fantastic!! This toy has a lovely old fashioned feel about it and you can imagine finding it in a forgotten box in the attic. We like this because: "it reminds me of toy soldiers I had when i was little (now that is a while ago)"